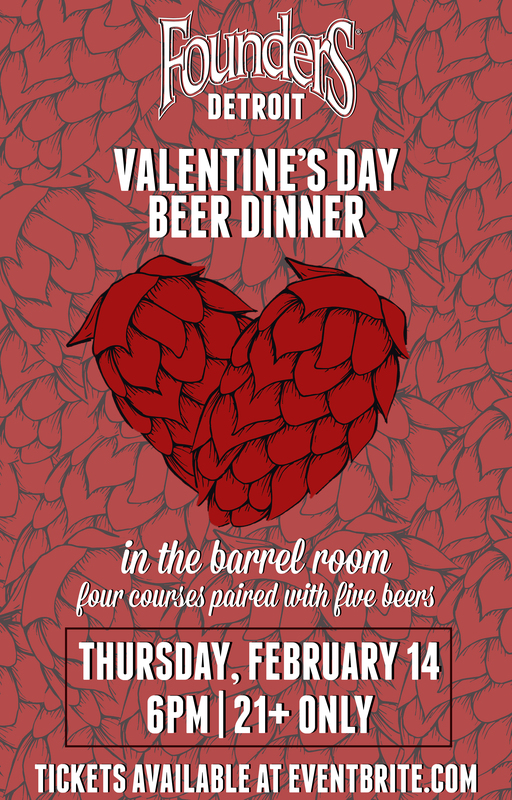 SOLD OUT Valentine's Beer Dinner at Founders Detroit - Founders Brewing Co.
Join us this Valentine’s day to celebrate our one true love – beer! Following in the footsteps of our Mothership’s famous Beer Dinner Series, we are excited to announce our very first Founders Detroit Taproom beer dinner, held in our beautiful Barrel Room that was inspired by the mining gypsum caves where we barrel-age our beers. Guided by our Culinary and Education team, we will be indulging in five beers spread out between four courses, and this will truly be a night to behold. Menu and beer pairings to be announced shortly, so please check back soon. This event is 21+ and seating is limited.